Fortress Of Freedom Board :: View topic - World Premiere Screening of The Fortress Experiment! 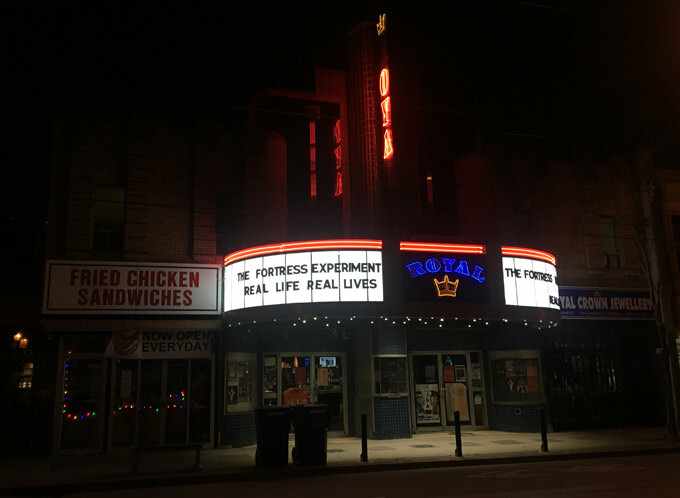 Posted: Sun Dec 30, 2018 12:29 pm Post subject: World Premiere Screening of The Fortress Experiment! Our show listing on the marquee during the day as we were getting prepared for the screening! 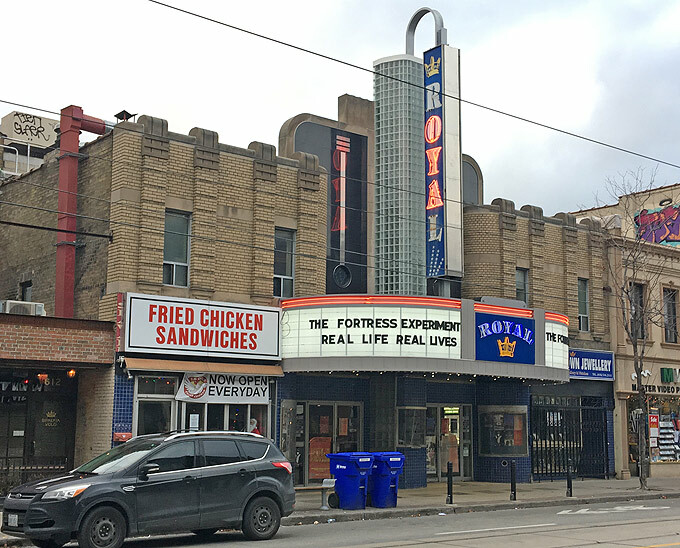 On December 22, 2018 Fortress of Freedom and IAIJ opened the doors of The Royal Cinema to cast crew and general public for the World Premiere of the documentary “The Fortress Experiment” and the short that followed called “Real Life: Real Lives”! The Fortress Experiment is a feature length documentary about a typical community of people given the chance to be all they could be and the result was some insight into what is important in our lives and how we should all live our lives. The short Real Life: Real Lives is a 17 minute documentary on street youth in the Toronto area. Our show at night on the marquee of The Royal Cinema! As the producer and director for both films it would be inappropriate for me to make and subjective statements about the actual reviews of the films, but I can take this time to thank the cast and crew who made these productions possible. There are many as in about 50 all told on both productions. You can check out the full castings and credits on the links below. Certainly the core group that helped me launch the experiment need to be named and these include: Dan Strudwick, Michael Atkinson, Dave Getchell, Shane Murphy. I would also like to thank all the support staff such as Samantha Blackwell, Laura Tommasone and Jessica King at FOF and IAIJ for their tireless help. Like I said, there are too many to list individually, but all are to be congratulated on a job well done. 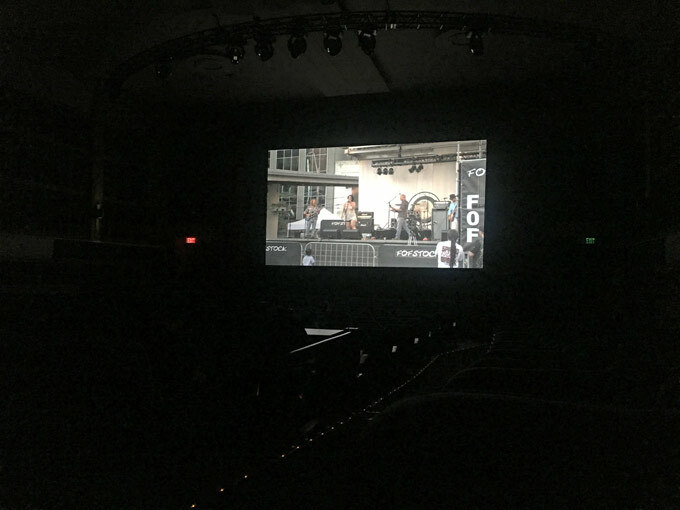 Our film on a 40' wide screen (that red light is an exit sign))! The Fortress Experiment is not only entertainment, but advocacy to promote a great idea! In the coming months and even years I hope this film gets a broad screening to educate and entertain discerning viewers around the world! Once again, many thanks to everyone who came out for this World Premiere, you people are the best!